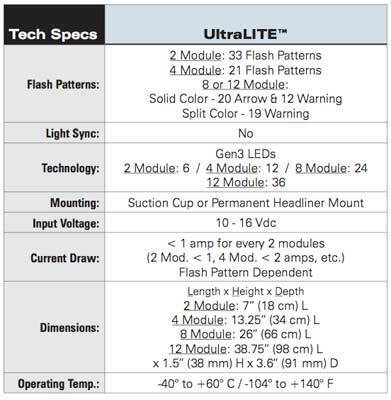 Each version is available in a 4, 8 or 12 module lengths. The 4 Module Windshield light includes windshield shroud, cigar plug & suction cup mount while the 8 or 12 Module Windshield lights include windshield shroud &11.5 of wire for hardwire installation. Vehicle specific mounting brackets are ordered separately for the 8 and 12 Module lengths so you can be sure your light installs properly into your vehicle. Lights meet or exceed California Title 13 and SAE J595 requirements.